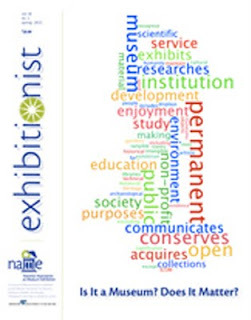 I recently chaired a session at the annual AAM meeting in Houston on the subject of "Non-Traditional Museums" that you can read more about here and here. It raised, amongst other issues, how to sort out the notion of on-line or virtual museums, or how to consider a museum of poetry. 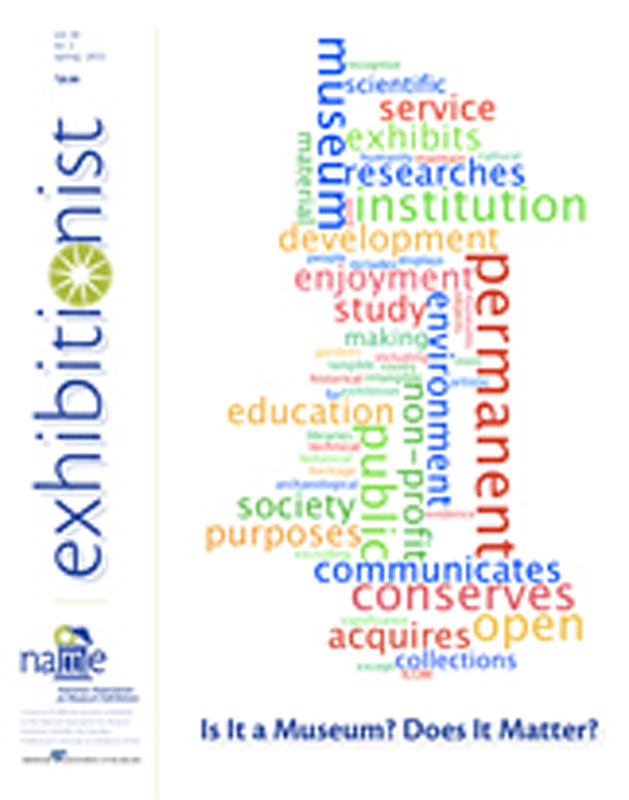 The latest issue of NAME's journal, The Exhibitionist (pictured at the top of this post) devotes an entire issue to the subject of "Is It a Museum? Does It Matter?" The issue is excellent by the way, filled with lots of meaty, thoughtful, contentious, messy stuff. Here's a link to download a sample article PDF. If you aren't currently a member of NAME (why not?) keep reading to the end of this post for your chance to win one of two copies of this latest issue that I'm giving away. And lastly, there is also a very lively discussion about the topics surrounding "Is It a Museum? Does It Matter?" happening right now on the NAME listserv. But it's a tricky business, trying to sort out whether to call something a museum or not, isn't it? On one hand, you don't want every roadside attraction or personal collection of knick-knacks to water down the term by calling itself a "museum." But on the other hand it doesn't seem so long ago that most science centers and children's museums weren't considered "official" museums because they didn't always maintain collections. In my own current thinking, I'm more concerned about what a creative group of people does, than what it, or others, calls the collective enterprise. However, the IRS, or funders, or professional organizations seem much less sanguine about such a loose notion of "museum." What do you think? Does it matter about what we do (or do not) call a museum? Let us know in the "Comments" Section below between now and June 6th, 2011 and you'll be entered into a random drawing to win a copy of the latest "Is It a Museum? Does It Matter?" issue of the Exhibitionist mailed directly to your door. If you're the shy and retiring type, and just want a chance to win a copy without making a comment, then sign up to become an email subscriber to ExhibiTricks between now and June 6th, 2011 by clicking on the link at the top right side of the blog, and you'll also be entered into a random drawing to win the second copy of the latest "Is It a Museum? Does It Matter?" issue of the Exhibitionist mailed directly to your door. I think what is most important in a museum is that it is engaging to a variety of people and is relevant to their experiences. Perhaps in some contexts, "alternative exhibition spaces" are more engaging and exciting than "museums" per se because these alternative spaces are typically based in communities, developed by and for the people in the communities. I would consider these places to be museums, but I don't think it matters whether or not they are called that. I recently met someone from Zambia who is very involved in capacity-building in his community, and I asked him what the museums are like in Zambia because I've never been there. He replied that he thinks of museums as places where people go to learn about the past and they are filled with dusty artifacts. Unfortunately, I think this may be a common perception of museums, especially in many places in Africa. In such cases, community-based "alternative cultural institutions" could be more successful. John Falk and I also conducted a session at AAM, Houston, about defining museums and whether it matters if we, as the museum field, control the definition. We staged a debate between those who were PRO control and those who were CON. It was a great discussion and reinforced, for me, that it doesn't matter what we think as museum people. It's up to our visitors to decide. What's important is that we stay relevant to them, not what we call ourselves. I've been heartened by the use of the word "curator" in the zeitgeist, Paul. Adopted by festival developers, film people, DJs, and others it lends a coolness that curators just haven't possessed previously. Houston AAM is a perfect example of the vibrant world we inhabit -- 200 art cars, the exquisite Turrell Live Oak Friends Meeting House, de Menil Collections, gallery crawl, zoo, children's museum, a health museum, science museum, a nationally admired museum district, to name just a few. As far as I am concerned, we can leave the arguments about nomenclature in the dust and continue to expand our reach. It's a very interesting and complex discussion. Maybe the term "Museum" should be reexamined for a new definition that will take into account the changes and the developments of the times. Maybe a new term should be created for something between a "visitor center" and a "museum". In anyway, as you pointed out, it is important and excellent, that creative work will be done and it doesn't really matter under what definition. Kristina, your comment reminded me of a great essay by Françoise Lionnet, "The Mirror and the Tomb." Ever read it? It's in the Carbonell Museum Studies book, and I'm pretty sure I've seen it elsewhere, too. It incidentally also involves Africa, and also resonates with your concerns about what a museum is, and what it means across cultures and communities. Thanks, Jason, for reminding me about this article...I read it many years ago, but had forgotten about it. And, Noa, I appreciate the definition of museum as "a place in which the muses dwell."